A brand new online casino added to our recommended list means a whole new range of bonuses to check out. We can all pretend that we’re here for the usability of the site or the customer service but let’s face it – it’s the size of the bonuses which play a big part in the decision to sign up. Keep reading to find out what’s on offer at 21Jackpots.com. This is a nice simple offer for all new players; you will receive a 100% bonus on your first deposit up to a total of $/£/€200. To make the most of this offer, don’t deposit any less than $/£/€200. This is a constantly running promotion which will randomly reward players with bonus cash directly into their accounts. The more you play and deposit, the higher the chance of receiving one of these cash drops. To be eligible you must have made a deposit in the last 30 days and played within the last 14 days. The promotion runs for 24 hours and you need to deposit using the bonus code ‘play’ during that time. If you feel as though a losing streak is heading your way then this might be the offer for you; every Thursday, if you deposit using the bonus code ‘Insure’ you will be given back 10% of your losses up to $/£/€200. As well as the above promotions, 21Jackpots.com run temporary offers so there’s always a different way to get something extra. Just check the ‘Promotions’ tab on the menu bar to see what the latest offers are. As you would expect there is a loyalty reward system available at this casino and you are signed up automatically as you join. You start at the Bronze level and work your way up by collecting a VIP point for each $/£/€16 wagered. 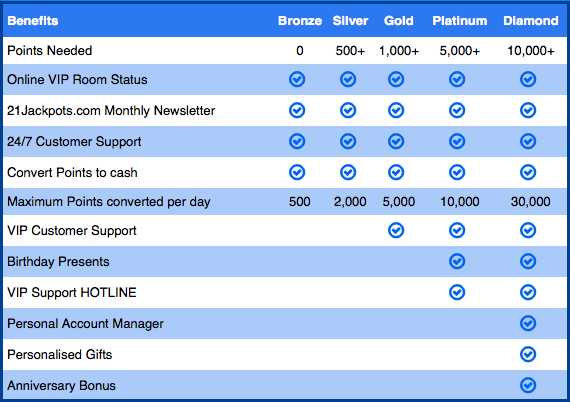 The charts below show the various levels of membership available and the rewards attached to each level.